Pique Newsmagazine is a free weekly publication, distributed on Thursdays. It is available for reader pick-up at racks and other convenient locations from Vancouver to Mount Currie, including Whistler businesses, restaurants and hotels. The Greater Lafayette Business Journal offers in-depth local business news that residents of the greater Lafayette area — including Acadia, Iberia, Lafayette, St. Laundry, St. Martin and Vermillion parishes — need and crave on a monthly basis. The ways in which different types of ad positioning affect readership is an ongoing discussion in the industry. Starch Advertising Research has measured consumer readership of hundreds of thousands of ads. To gain perspective, MediaPost asked Dr. Mickey Galin, Senior Vice President, Starch Advertising Research, to weigh in for a Q&A on the topic. Q. Why did Starch Advertising Research conduct an ad adjacency analysis? A. Let me be up front: We don't have all the answers. 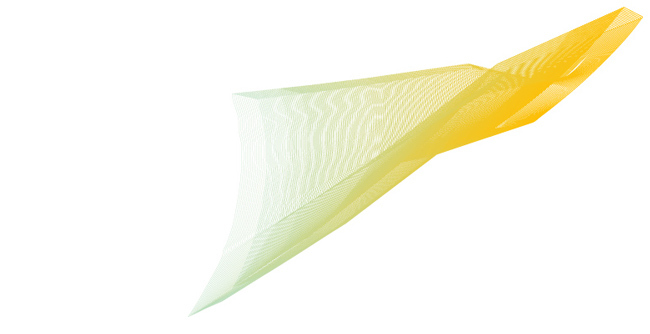 There are no hard and fast rules; a killer creative execution can change everything. But we are in a really good position to offer some fact-based guidance on which ad positions seem to work better than others, particularly because our analysis is probably the largest of its kind. Q. How was the analysis done? A. This analysis was about ad adjacency only — not other forms of ad positioning. We literally hand-catalogued the nearly 68,000 ads Starch measured from January '09 to June '10 — across 1,884 magazine issues — according to their adjacencies. For instance, was the ad next to another ad, next to the cover story, next to an article or next to a relevant article? By the way, we define "relevant article" as being about the same subject as an adjacent ad. Q. Is this a one-time study, or does Starch intend to carry out another analysis or even make it a regular service)? A. This Ad Adjacency information is now in the Starch database, so clients can do their own, updated analysis whenever they wish. We recently completed our historical cataloguing of ad adjacency information — the 68,000 ads under consideration in this analysis are included in that cataloguing. However, all ads we measure moving forward will similarly be catalogued in this way. Starch users will eventually be able to slice and dice ads according to adjacency positioning in any way they choose: magazine genre, specific magazines, ad sector. Q. What did you find in your analysis? A. There are a couple of headlines here. Ads next to editorial, on average, are read by more consumers than ads next to other ads. 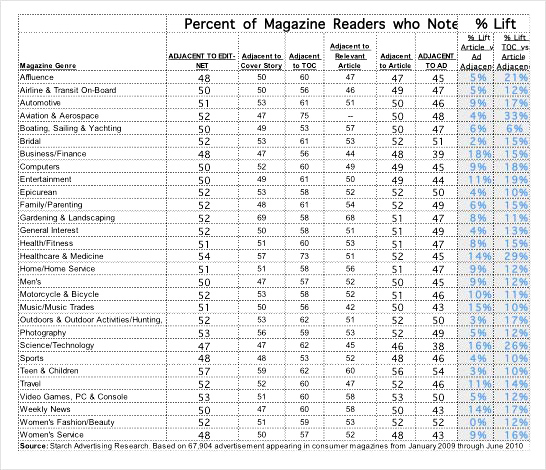 Specifically, ads next to edit are, on average, read by 51% of magazine readers compared to 46% of readers who noted ads adjacent to other ads. This is a five-percentage-point difference, which is fairly significant. Put another way — ads adjacent to edit get an 11% lift in consumer readership when compared to ads adjacent to other ads. What type of edit an ad is next to, however, doesn't seem to have much impact — except in one instance. Being placed next to a cover story or a relevant article did not increase readership any more than being next to any article. On the other hand, being placed next to a Table of Contents has a strong impact on readership; on average, there was an eight-percentage-point difference between readership of ads next to a TOC and ads next to any form of edit — and a 28% lift in readership when comparing TOC adjacency to being next to another ad. Q. Are there any exceptions to the rules? A. There are plenty of exceptions. For example, women's fashion and beauty books seem to buck the "it is better to be adjacent to edit than ads" trend. There was virtually no difference in average scores for ads opposite edit as opposed to ads opposite other ads in this genre. Bridal is another genre where the impact of an ad being placed next to edit is not as large. On the other hand, business and finance books, in general, act in the opposite direction; across all titles in this genre, ads received an 18% lift in readership by being placed adjacent to an article as opposed to an ad. Q. What other genre-specific insights did you find? A. One of the really interesting findings is how relatively well ads next to magazines' table of contents perform across all genres. This is not only true for the analysis as a whole but also when you look at ad performance by magazine genre. There was a double-digit lift in readership for ads adjacent to a table of comments vs. another ad in every single genre. The same was true when we compared readership of ads next to a TOC vs. next to other edit; again a double-digit lift in readership across all genre — as high as a 33% lift in the case of the aviation and aerospace genre. Q. What about other forms of positioning? What has Starch Advertising Research learned about the efficacy of them? A. Ads in cover positions tend to have the highest noted scores. And, ads in the front of a magazine tend to be read by more readers than ads in the back of the magazine. But, perhaps surprisingly, we have found no difference in readership scores between ads on right-hand versus left-hand pages. Q. Can you speculate about why an ad next to editorial content gets this lift in readership, relative to an ad next to another ad? A. Well, my opinion is purely speculative. Starch does not ask consumers why they read a given ad, just if they read a given ad. But I do think there are some common-sense observations: Readers probably stay on a page longer if they are reading an article or a TOC. And it's certainly no secret that some consumers avoid ads in any medium, be it print or electronic. However, this doesn't seem to be the case for books, where the ads are almost seen as part of the editorial package — where consumers read the magazine for the ads as much as the articles. We see that happening with woman's fashion and with bridal titles. Q. How do you envision the marketplace using this data? A. I'm hopeful this top-line analysis will give an up-to-date framework to aid in the positioning conversation between advertisers, their agencies and publishers. It can help to sort of anchor the discussion. An advertiser, for instance, may learn that pharma ads buck the overall trend and work best when being placed next to a relevant article — and can have that positioning conversation with the magazines carrying its campaign. Q: Is there any way the findings might help streamline the work of media buyers and planners? A. I don't think this will streamline the positioning process for buyers and planners. On the other hand, this data does have the potential to give buyers and planners more meaningful positioning planning metrics, so they can maximize readership for any given campaign. Q: On the publisher side, could the data inform strategies to make magazines overall more effective as an ad medium — e.g., by making sure ads are separated by editorial content? A. Yes, I think magazines can strategically use this data. But I would argue that making sure ads are separated by editorial content is only a start — and may not be appropriate in every instance, such as fashion ads. Publishers can use this data to understand how their title or genre performs for different advertising categories and develop strategies from there. And to educate advertisers on the power of print. What other medium offers 50+ percent of ad recall on a consistent basis? 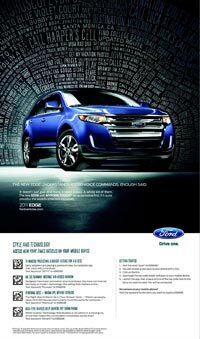 Ford recently kicked off a new combined print and mobile campaign for its Edge crossover in The New York Times that includes 2D barcodes in print ads providing readers with access to Times articles on technology and style on their phones. Ford ran a full-page ad in The Times featuring the 2011 Edge, highlighting the vehicle's new voice recognition technology called MyFord Touch. An upgrade to the automaker's Sync in-car communication system, MyFord Touch promises the ability to recognize up to 10,000 voice commands and launches initially with the Edge. 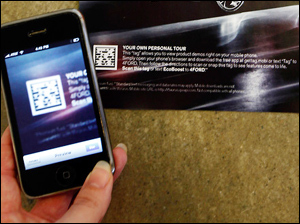 The bottom of the ad includes 2D barcodes providing mobile users with camera phone access to a selection of Times articles on technology and style intended to appeal to tech-savvy prospective Edge buyers. When someone uses the barcodes to link to the stories on their handset, Ford banner ads will appear at the top of those mobile pages, extending the company's branding to the phone screen. People without camera phones could text a specific keyword for each of the four featured stories to 698698 to receive the link to that article on the mobile site. Ford also bought a home page takeover of the Times' mobile site on Thursday. Eric Peterson, a Ford spokesman, described the pairing of print with mobile, combining the reach and content of The New York Times with a mobile tie-in, as "a perfect fit for the Edge." He added that the inclusion of Times articles that related to the tech-centric theme of the campaign came about through joint planning and discussion by Ford and the newspaper's ad staff. Times spokesperson Kristin Mason said the Edge ad was the first time the newspaper has worked with an advertiser to include barcodes that link to Times content. Because the articles are identified as Times stories in the print ad and appear with reporter bylines on the site, the newspaper is not worried about readers mistaking them for advertorial. The barcode and mobile component will be part of seven placements by Ford with the Times through the rest of the year, according to Mason. If an individual subscribes to both the print and replica digital edition of a publication, the digital edition can be reported as Qualified Paid Digital Edition if the subscriber requests and pays a separate rate of at least $.01 for access to the digital edition. Yes, please start my subscription to The Chronicle for just $50.00 per year. Yes, please give me online access to the digital edition for just $5.00 more. A subscriber must provide a valid email address when subscribing to the digital edition and bounced emails must be removed after 90 days. Digital editions that are provided as a benefit of subscribing to the paid print edition are not considered Qualified Paid Digital Editions. Upon publisher’s request, the Recency of Renewal chart in the Audit Report can be presented in a variety of ways. In the past, subscription aging was presented as 1 year, 2 year, 3 year and 3+ format only. Verified now offers publishers the option to "roll up" their reported aging. Instead of breaking out the subscription renewals into separate years, aging can be represented as shown below. Publishers can roll up their aging to 1–2 years instead of 1–3 years as well, or continue to report aging as they have in the past. Tradeshow/event copies are copies distributed through exhibitions, seminars, conferences, sporting or other events. Tradeshow/event copies are normally considered non-qualified circulation. However, if the following information can be provided, these copies may be considered qualified circulation. Details of the tradeshow/event, including date of event, documentation of purchase of booth space, number of attendees and any attendee demographic information available. Distribution records with a complete list of names and addresses of the distribution points and third-party distributors involved in the delivery with details such as the number of copies delivered and distribution dates. A list of the number of copies by location or distribution point. Financial records, copies of cancelled checks, bank statements and other information to provide proof of payment for the distribution and/or receipt. Documents signed and dated by a representative confirming receipt of delivery at the distribution point, indicating the number of copies received. For publications distributed two or more times per month, returns from the tradeshow/event must be tracked. Only net copies (gross copies less returns) will be considered qualified circulation. Qualified Tradeshow/Event copies must be current issues, not back issues. Qualified circulation may not exceed the number of tradeshow/event attendees. At Verified's discretion, additional field survey work may be conducted. A list of the tradeshow/events and the number of copies delivered to each event must be included in the audit report. An explanation of the method of distribution is required as well as the statement, "Distribution to tradeshows/events is only audited up to the distribution point and not to the end user." A Non-qualified Digital Edition is defined as a subscription that has not been individually or company requested or served as a benefit of membership and meets the qualifications stated in the Field Served and the Recipient Classification of the publication. If the publisher is unable to provide proof of conformance to these guidelines, the copies may not be claimed as non-qualified digital editions. For the audit, publications are required to provide source of non-qualified digital edition subscribers, proof of distribution (SMTP files, summary reports, etc.) and qualification data. Digital editions which meet the qualifications of non-qualified digital edition will be reported in the explanatory section on the Audit Report and Publisher’s Statement. An average of 1,325 non-qualified digital editions are served to individuals who meet the qualification of Field Served and Recipient Classification. Non-qualified digital editions severed to advertisers or agencies and non-qualified paid digital editions (excluding sponsored) may be reported in the average monthly circulation table on the audit report. All other non-requested digital editions may not be reported. If you have any questions regarding the updated audit guidelines, please contact Verified at 415-461-6006.